Magic is an 11 year old, 15.2 hh Thoroughbred gelding. He is sweet, personable, mellow and sensible. He has been shown dressage successfully at Training Level and has debuted at First Level with scores in the mid-60s. He has been shown over fences at 2', schooled to 2'6". In his first season of showing, he won two year-end Reserve Championships in dressage and a Thoroughbred Incentive Program (TIP) High Point award for Combined Training. He has also participated in hunter paces and is super quiet on the trail. He has even dabbled a little in Western, winning a TIP award his first time out! Magic is an all-around great guy but he prefers relaxed riders with quiet hands of just about any skill level. Magic is a huge fan of napping and carrots. 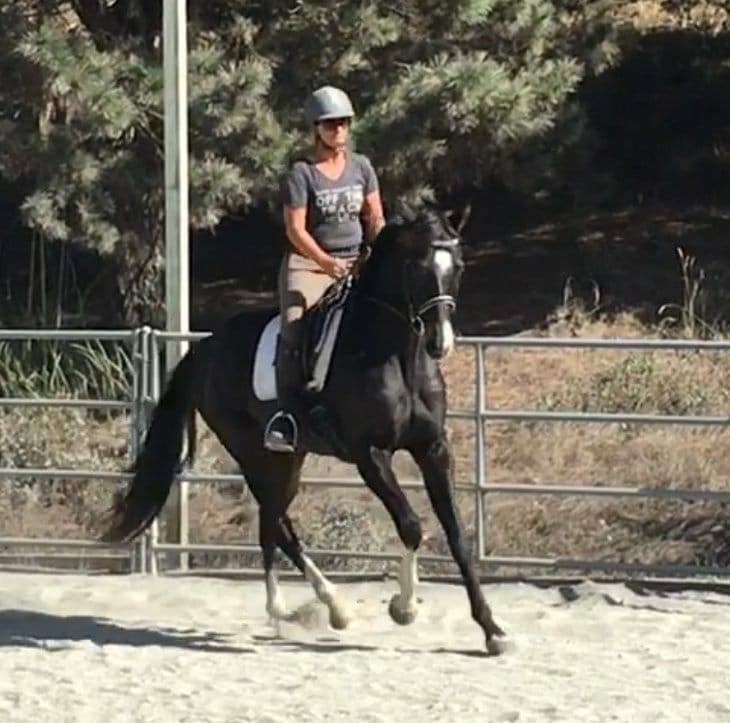 Magic is half-leased by our darling working student, Lily, and is available for another partial lease and occasional lessons. Norman is a 6 year old, 16.1 hh Thoroughbred gelding. He's quirky and precocious and we wouldn't want him any other way! After leaving the race track he had a year to adjust to his new life and is now in regular work. We are allowing him all the time he needs to progress as he's still growing (stop that!) and managing his ridiculously long legs will not happen quickly. Norman enjoys being the center of attention, but on his terms. Bucket time is his favorite time. Norman is Emily's personal horse, shared with Maggie. He may also be available for a part time leaser, but they will have to be super special! Sadie is a 4 year old, 16.1 hh Thoroughbred mare. You just won't find a sweeter, more cuddly, and delightfully curious horse! With a strong foundation of classical dressage training we are exploring all English disciplines to find which she enjoys most. She is exhibiting signs of being a hunter princess and she would excel! Sadie would love to have her forelock brushed all day long and is a huge fan of anything food-related. Sadie will be available for sale in the future. She is currently under the expert management of Ronan and part leased by Jess. Toby is a 16 year old, 14.3 hh Paint gelding, generously loaned to our program. He is easy and the ultimate confidence builder. He doesn't feel like a small horse and has the smoothest trot you'll ever sit. He's the steady eddy that we'd be lost without! Whether it's a new or fearful rider, or a babysitter for baby horses on the trail; he's the guy we can always rely on! Toby enjoys eating and often views trail rides as an extended trip down a buffet line. ​Toby is half leased by Tanya. Fiona is a 21 year old, 13.2hh American Paint Pony mare. Fiona has the best ground manners, unlimited patience and is ideal for helping kids learn how to groom independently. 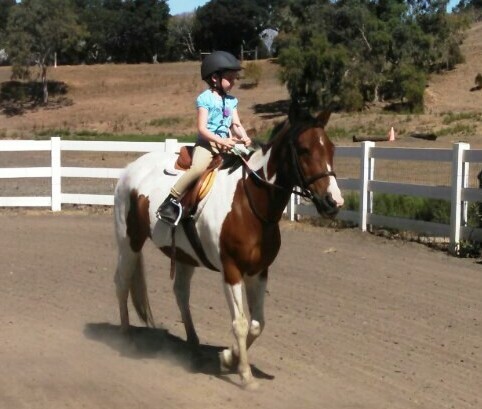 While she's doing well as a leadline lesson pony she's really a fun ride for a smaller adult. She has a large build and easily carries a rider up to 5'4". She has comfortable, big horse gaits and is fun and forward. This pony can JUMP! Fiona is the best trail buddy you'll ever find. She's happy to go out all day on her own, with a group, and has ponied much larger horses for miles. She is incredibly surefooted and covers a lot of ground. Fiona is sweet but very business-like. She would be happy to trail ride every day and has requested retirement from arena work. Fiona is available for half lease, to share with Anna Marie. Another adult trail riding enthusiast under 150 pounds, please! © Down Centerline Dressage 2016. All Rights Reserved.